First, interestingly, "mild panic" set in. (Well, okay, not quite panic, but you know what I mean). What was I going to be missing?! 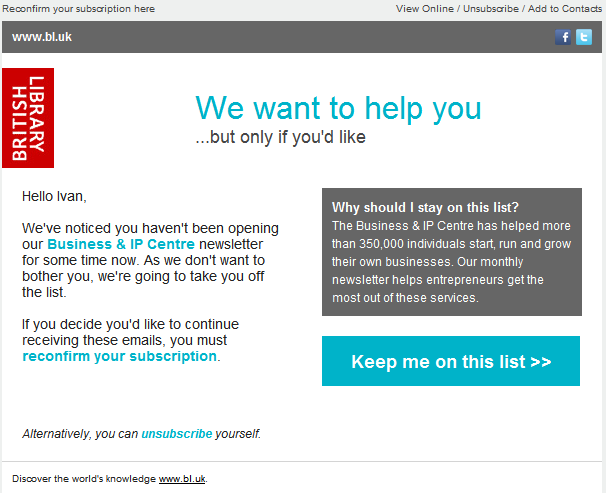 What was I about to be unsubscribed from without me knowing? So I opened the email. And once my heart-rate had returned to normal, I realised it was the BL informing me that because I hadn't opened one of their regular emails for some time, they were going to unsubscribe me unless I specifically clicked on a button to remain subscribed. And I quite liked that. 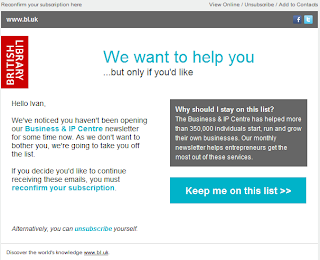 It made me wonder initially why I wasn't opening their emails and if I did really want to continue to be subscribed. So I clicked and did re-subscribe. However, personally, I think this is a great exercise in promoting supporter choice, which is something I quite believe in. Surely it makes more sense to only be sending emails to people who want to receive them. Surely it provides a better ROI - after all, even if each email only costs a few pence to send, thousands of such emails will add-up each time they are sent, and they are likely to be sent many times during the year. So the total cost will add up. And, by getting people to re-confirm their subscription, by definition you have someone who has taken a positive action to remain interested, and that in itself could be an interesting segment to approach. Now you know something more about them. Maybe you could send them an initial "welcome back" email with a particular message or options to take? Maybe they could be allocated a different customer journey? As yet, I haven't received anything like that from the BL but I will wait to see. (I was also slightly disappointed that the email click-through was to a generic page on the BL website rather than a 'Great, thanks for doing that - now have you thought about…' type page). The Technical SideOf course, to do this, it takes one critical technical thing: an email marketing system (EMS) which can monitor if someone doesn't open an email; and alongside that, a database - whether within the EMS or in a separate CRM - which the marketers can query in order to find out which people they should target with such a message - which people have not opened x emails within the last y months/campaigns etc. And of course, a database where, if I am subscribed to several different emails from the organisation, then it needs to be able to not blanket unsubscribe me but just opt me out of this specific email campaign. It’s a great example of the digital world with a smart database and with some savvy marketing users coming together to try this out. Kudos to the BL.